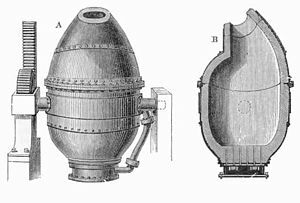 ^ “Bessemer process”. Britannica. 2. Encyclopedia Britannica. (2005). pp. 168. ^ “Kelly, William”. Britannica. 6. Encyclopedia Britannica. (2005). pp. 791. ^ a b c Hartwell, Robert (1966-03). “Markets, Technology, and the Structure of Enterprise in the Development of the Eleventh-Century Chinese Iron and Steel Industry”. The Journal of Economic History 26 (1): 29–58. ISSN 00220507. http://www.jstor.org/stable/2116001 2009年11月24日閲覧。. Page 54. ^ Bessemer, Sir Henry (1905). Sir Henry Bessemer, F.R.S.. Offices of "Engineering,". p172. ^ Anstis 1997, p. 147. ^ Robert Mushet Archived 2012年8月22日, at the Wayback Machine. ^ Anstis 1997, p. 140.